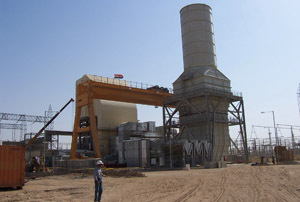 EMH Overhead Cranes in Power Plants | EMH, Inc. This 130/25/15 ton, 105 foot span, double girder gantry is used to install and service turbines at on overseas power plant. 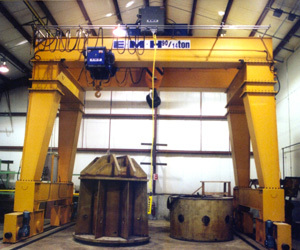 The cranes uses three EMH Engineered hoists. Two are mounted on a double girder trolley with service walkways, and a torsion mounted hoist runs along the side of one girder. The crane uses eight bridge drives. The all-inverter controls are mounted in a stainless steel enclosure, which is covered by a sun shade, and air conditioned. This 200/50 ton radio-controlled crane loads turbines onto rail cars for shipment. 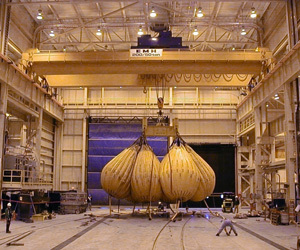 Crane has a span of 75 feet, a lift of 40 feet, and uses two EMH Engineered hoists. A 90 ton gantry with a 14 ton auxiliary hoist at a New England power plant.